Speakers: Sophie Viger, General Manager of the 42 school in Paris and in the Silicon Valley, Sacha Quester-Séméon, Entrepreneur and Founding Member of the #JamaisSansElles Movement, Ankhi Das, Public Policy Director Facebook India, Isabelle Galy, Deputy Director of Operations at the Learning Lab “Human Change” at the CNAM Engineering School, Asad Baig, Founder and Executive Director of Media Matters for Democracy, Pakistan, Bishakha Datta, Film Maker and Activist, Founder of the NGO Point of View, India, Noha Ashraf Abdel Baky, Senior Analyst at Dell, Egypt. Discussion co-hosted by Sylvain Attal and Sheetal Kumar. On the occasion of the 13th edition of the Internet Governance Forum (IGF) hosted annually by the United Nations General Secretariat, #JamaisSansElles has organized, in a co-development with Media Matters for Democracy (Pakistan), a workshop dedicated to gender diversity issues in cyberspace. The goal of the IGF is to bring together all stakeholders and encourage them to discuss all public policy issues related to the Internet. It helps participants to discuss and exchange information on the best practices to implement. The workshop, co-hosted by #JamaisSansElles, looked at how the use of digital tools and social networks can help to establish conditions for the real inclusion of women in all public and professional sectors on the one hand and at new democratic processes that are more effective and responsive on the other hand. Education is a key issue in creating a more diverse digital world. To create a more inclusive digital world, the issue of education is central. The education system itself, especially in STIAM [science, technology, engineering, arts and mathematics], needs to evolve and adapt to become more welcoming to women and girls. Sophie Viger, general manager of the 42 computer programming school, stressed “the importance of the role of young girls and women: coding schools must provide them with a diverse and welcoming space.” She believes that the situation can be improved by carrying out simple actions like “a special welcome for girls” or the condemnation of misogynist remarks made by students. School 42 has taken steps to increase the number of women, which is currently only 15%, and to reduce the sexism that has been shown to be greater when women are in the minority. The school will reserve 50% admission for women in pre-selection interviews and is considering coaching sessions to prepare young girls. Schools that provide girls and low-income minorities with access to education in new technologies, coding and engineering should be encouraged. They should also test new teaching methods for marginalized or struggling students. Digital technology can become a powerful tool for digital empowerment and inclusion. Gender diversity on the Internet: online security is a basic need. Online security is a prerequisite. To achieve digital inclusion and balanced gender diversity on the Internet, online security is a fundamental need. In fact, hate speech and online harassment significantly impede and limit the political participation of women and non-binary people. This is why the private sector, especially digital platforms and social networks, must take responsibility in this area. “Human Impact Assessments” should be implemented to measure the consequences of hate speech against women and non-binary people (LGBT +). Among the first actions to be taken is to make women more visible and influential by giving them the floor and enhancing the creation and distribution of online content highlighting female role models. To make a real difference, concrete commitments are needed. #JamaisSansElles promotes gender diversity and the inclusion of women in all sectors of society by very simple, direct action. This does not entail any particular rule-making and can be applied by anyone, immediately: By signing the founding charter, launched in 2016, men commit to never being on a panel, speaking in a conference or participating in a committee of experts if no women are present. The association has achieved excellent results in terms of public participation and visibility of women, especially in digital economy events, by relying on the support of male leaders (250 signatories at the end of 2018) who made the commitment in a personal capacity. It has been remarkably effective and has encouraged committee and events organizers of all kinds to pay attention to gender balance. 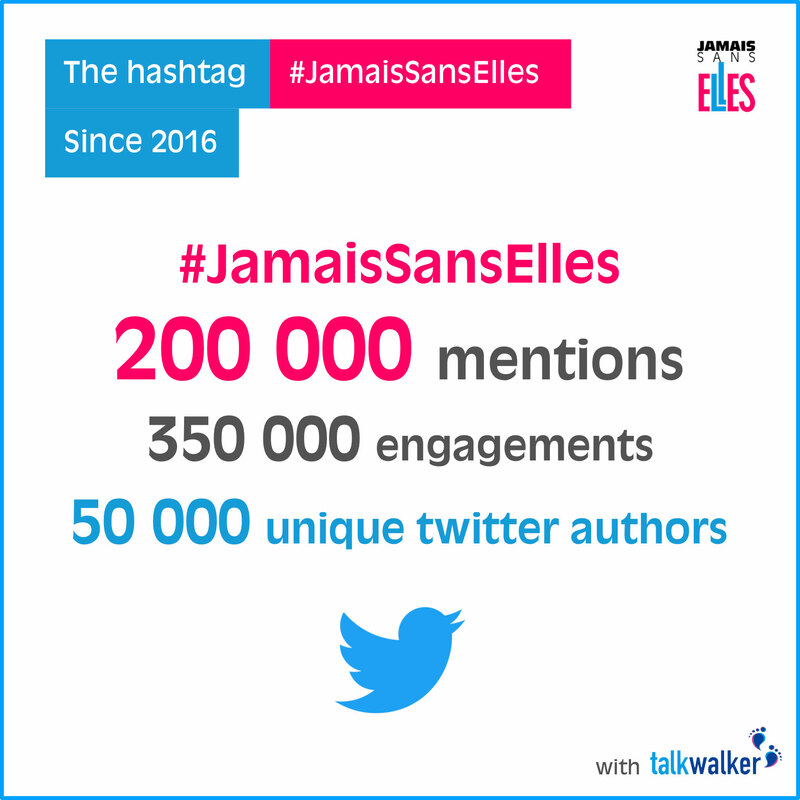 The movement then spread to the political world where many MPs and senators signed the #JamaisSansElles Pledge. Since social media is so effective now at distributing images of exclusively male newsgroups and round tables with the hashtag #JamaisSansElles, such commitments can not be limited to verbal statements. They must be effective: the people are watching! But the issue of visibility is only the tip of the iceberg, as Sacha Quester-Seméon of #JamaisSansElles points out. The association also focuses on women’s access to key management and decision-making positions in all areas, and emphasizes their equal recognition and participation in all sectors of society, for shared governance. It is with this understanding that the movement also created a corporate charter for businesses wishing to create a virtuous circle to attract women at all levels. This involves actions that take into account the context and opportunities specific to these companies, initiated in collaboration with associations active in the field. 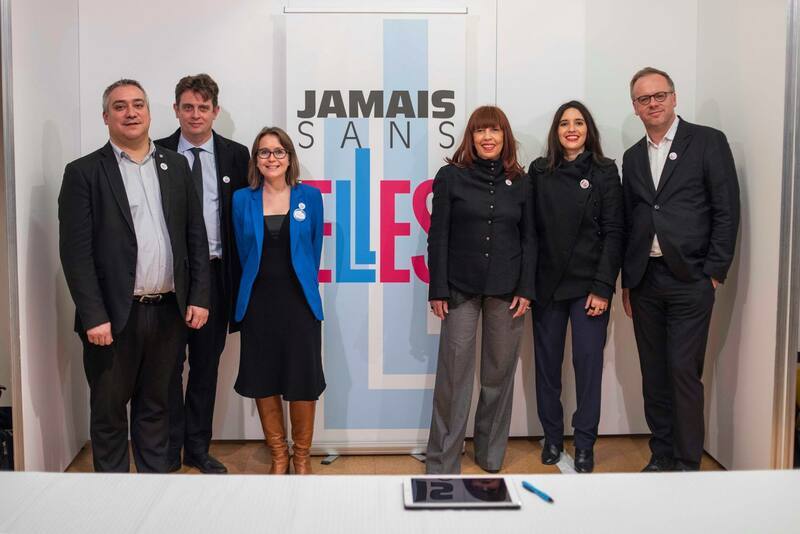 Microsoft France was the first signatory of a #JamaisSansElles corporate charter. Governments and institutions can not act in favor of gender equality and equal recognition and participation of women and non-binary people (LGBT+) in the digital world, without involving all stakeholders in Internet governance, which includes civil society as well as the private sector. This is the principle of the multi-stakeholder approach, and it is essential. As an association, #JamaisSansElles actively participates in the multi-stakeholder approach by liaising with leaders, businesses, women’s networks, and by being a stakeholder in Women20, the official G20 Engagement Group, which brings together the expertise of women’s civil society organizations and women entrepreneurs from around the world. #JamaisSansElles also speaks to the question of women’s presence in the field of artificial intelligence, where sexist biases can become permanently entrenched and consequently affect our understanding and decisions. However, according to a survey conducted by Wired magazine and the Canadian start-up Element AI, only 12% of leaders in the field of machine learning are women. Women also account for only 10% of Google employees that work on machine intelligence, and for 15% of Facebook’s AI team. 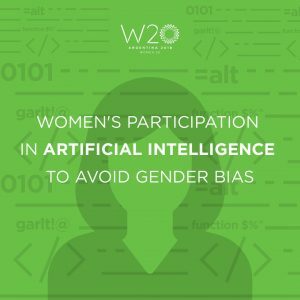 One W20 recommendation specifically addresses the issue of female participation in AI. 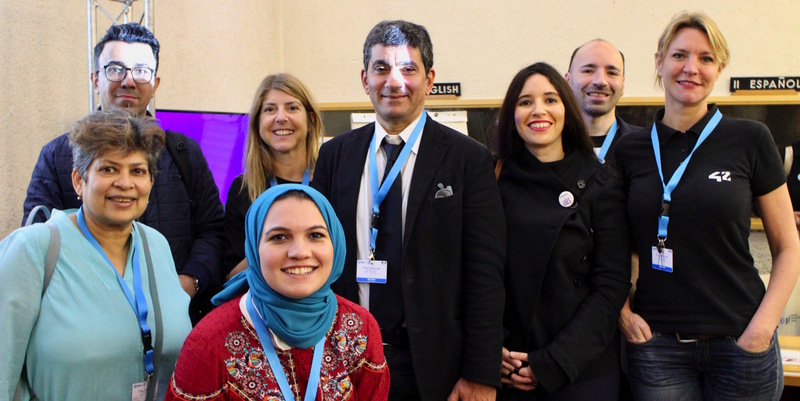 🖋 At the IGF 2018 at UNESCO, #JamaisSansElles launched a charter for Internet governance stakeholders with ISOC France, Reporters Without Borders, and Renaissance numérique, for equal recognition and participation of women in digital technology. Let’s not leave half of humanity behind! On the occasion of the IGF 2018, #JamaisSansElles launched a Charter for Internet governance stakeholders at UNESCO for the equal recognition and participation of women in the digital world. ISOC-France, Reporters Without Borders, and Renaissance Numérique were the first signatories. 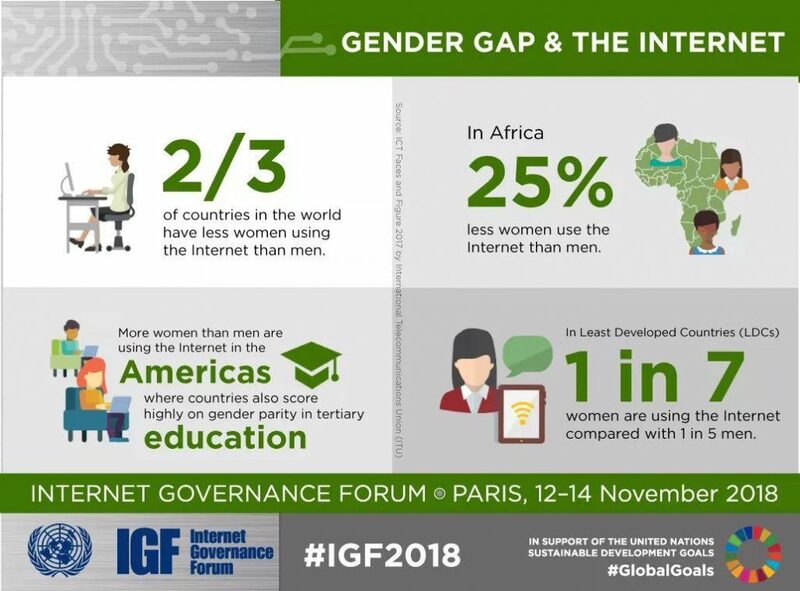 The final statement from the IGF echos key messages from our movement: “Women and girls make up half of the global population. The digital revolution should be a tool for empowerment and emancipation, promoting equal opportunities for women and men in all countries. Key figures in the digital divide that affect women around the world are also highlighted in an infographic. Find here the complete report of the workshop in English.